What does Hugo Chávez leave to the Venezuelan people? Three legacies, all of which are poisoned: a harebrained way to govern, the mindless 21st-Century socialism, and a neopopulist model based on welfare-patronage. • First, he leaves them the memory of a colorful character who was very funny. He governed badly but was amusing and monopolized the newscasts. Fourteen years of surprises, never a boring moment. He sang, played baseball, insulted others, fought with practically everybody and then befriended them again, as happened with Colombian President Juan Manuel Santos, against whose country he almost declared war but eventually avowed friendship — a feeling that, ended up being mutual. That’s no way to lead a country. It is a bad example that propagates swiftly. Nicolás Maduro, the heir-designate, is a Chávez apprentice. That eccentric way of appearing in public, what some people call “charisma,” usually generates much attraction among the less-educated Latin American classes but inevitably leads to disaster. True, seriousness is not always effective at the polls, but shouldn’t be dismissed outright. 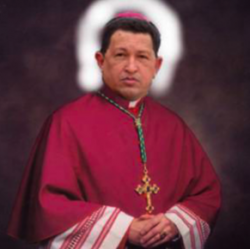 • In second place, Hugo Chávez leaves among his cohorts a substitute for an ideological vision. Twenty-first-Century socialism is not an ideology, though Heinz Dieterich, its jolly German-Mexican theoretician, touts it as such. Instead, it is a surrogate composed of three noxious elements: anti-Americanism, anti-market policies and a rejection of private property as a way to generate wealth. Of those three factors, the key one, the one that binds them, is anti-Americanism. Just as Hitler was convinced that all of humanity’s ills derived from the existence and actions of the Jews, Chávez, heeding Fidel Castro’s guidance, lived and died fully persuaded that the White House was really Satan’s lair. That’s the only explanation for his barefaced assertion that the earthquake that devastated Port-au-Prince was the result of a secret weapon tested by the Pentagon in Haiti’s capital as a way for American imperialism to seize that country’s wealth. How can anyone say such a stupidity and not be locked in a loony bin?Along with the intrinsic wickedness of the yanquis, there is the intrinsic evil of the private market. According to Chavismo, prices must be controlled, so that the poor may acquire goods and services. Multinational corporations are evil. Merchants are agents of imperialism. Economic freedom is a farce. Instead, equity resides in the good will of a legion of benevolent functionaries. Chávez believed all that and inoculated his supporters with these ideas. To him, a just society was possible only if a group of revolutionaries, led by a strongman enlightened by Providence or Simón Bolívar, which is the same, dictates the what, how and when of commercial transactions. • But, of the three legacies that Chávez left to his executors to manage in a revolutionary manner, the third is the worst: neopopulism. That is, the notion that society should live from the output of the state, not the opposite, as happens in the world’s prosperous countries. It should be noted that, in the democratic Venezuela before Chavismo, there was a populist substratum fostered by supporters of Democratic Action, a Social Democratic party, and the COPEI, a Christian Democratic party — the traditional political groupings. Hugo Chávez multiplied one thousandfold their wrong way of distributing public resources. In his 14-year tenure, while more than 100,000 private companies folded and hundreds of thousands of Venezuelans chose to emigrate, the Bolivarian president created a welfare-patronage system based on granting subsidies and creating “missions” that distribute goods and services, generating a parasitic attitude in millions of people who, naturally, will vote for whoever props them up. That accursed legacy will be very difficult to eradicate. The Argentines have not been able to do it in more than 60 years.